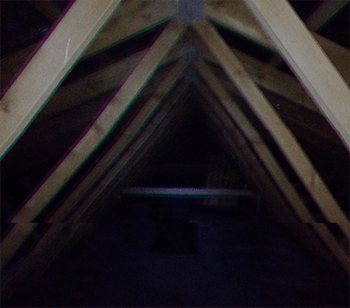 Image recovered from family camcorder, believed to be the interior of the Lee family attic. Date impossible to determine. Special Containment Procedures: Due to the nature of SCP-2740, any means of direct containment are currently unfeasible. Access to ████ █. ██ St, █████, IN is forbidden, and is to be enforced by Foundation security personnel. Cover story Delta-4B "Gas Leak" is to be disseminated in █████, IN. Standard cognitohazardous object amnestic treatment is available to all personnel assigned to SCP-2740. Description: The nature, appearance, and potential existence of SCP-2740 is uncertain. 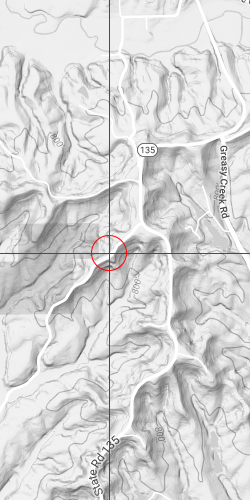 SCP-2740 is believed to possibly exist in the northwest corner of the attic in the home of the Lee family at ████ █. ██ St, █████, IN, a location roughly 6m from the ladder leading to it. Individuals attempting to approach the ladder leading to the attic will find themselves unable to do so; while individuals can approach the ladder and, in certain cases, even begin to climb it, upon further inspection it will always be discovered that these individuals did not in actuality do so. The reason for this is currently unknown; additionally, it is uncertain if this effect exists at all. Research into this phenomenon is ongoing. The only information gathered regarding SCP-2740 has been done so through interviews with affected individuals. SCP-2740 appears to instill a sense of intense dread in any individual cognizant of it, although the reason for this is unknown. This effect begins upon entering the house at ████ █. ██ St, or by becoming cognizant of SCP-2740 through discussion with other individuals affected by its anomalous nature. The following interview was conducted after the discovery of SCP-2740 with Franklin Lee, the owner of the home at ████ █. ██ St and patriarch of the Lee family. Dr. Dorsett: When did you begin to notice something was wrong? Franklin Lee: Maybe… I don't know, it was years ago. It wasn't always like this, though. In the beginning it was just something, you know, you could ignore it. I remember there would be times I would walk down the hall upstairs and just- just glance at it, and get this feeling. Dr. Dorsett: Can you describe the feeling? Franklin Lee: Like there was something up there. Not that I could see it or anything, and we didn't hear anything either. The mood in the house changed, and we thought it was because she- I… no, it wasn't that. Dr. Dorsett: Mr. Lee? Who do you mean, she? Franklin Lee: Our oldest daughter, Olivia. She left when she was seventeen, and… there were some other things going on then, we were going through some hard times. Olivia left to go live with my wife's sister, we haven't talked to her in years. I think… I don't know, maybe we did start to notice it then. Dr. Dorsett: What did you originally notice? Franklin Lee: …I tried, I can't tell you how many times I've tried. I'll begin climbing, and open my eyes, and I'll be back in bed, or in the living room by the tv, and the feeling never goes away. I quit my job, I couldn't handle the stress. I couldn't explain it to anyone, everybody thought I was crazy, but… there were a few times I contemplated knocking the whole house down, I even signed the papers once, but then I called back and the company didn't exist anymore. Dr. Dorsett: Why didn't you move? Franklin Lee: …You don't think we tried? It was like climbing that ladder; you get halfway up, you push open the door, and you can feel it, but then… then you're sitting at the kitchen table. Following this interview, Mr. Lee and his family were moved to Site-81 for holding and examination, with release pending further study of their mental condition The Lee family has not been moved to Site-81. Information claiming otherwise has been proven inaccurate. Research into this is ongoing. The following interview was conducted after the discovery of SCP-2740 with Yvette Lee, the co-owner of the home at ████ █. ██ St and matriarch of the Lee family. Dr. Dorsett: Mrs. Lee, can you tell me anything about why your husband wasn't able to articulate any details about SCP-2740? Yvette Lee: …Have you not been in the house, Dr. Dorsett? Yvette Lee: Then you can't understand. We've lived there for twenty years, and we can't even… we can't do anything about it either. We've tried everything, but nothing works. Dr. Dorsett: We have reason to believe that you have entered the attic1 on ██/██/████. Can you confirm this? Dr. Dorsett: Mrs. Lee, this will be much easier if you can be honest with us. Yvette Lee: …I don't know. It wasn't Olivia. Incident Log 2740-A: After interviews with Mr. and Mrs. Lee and their children, and with neighbors also affected by SCP-2740, all of whom were certain of the existence of SCP-2740 but uncertain of any other details, several attempts were made to penetrate the attic, both manned and unmanned. In all cases, further investigation revealed that no attempts were actually made, regardless of the claims made by involved personnel stating otherwise. These attempts may have included direct access through the second floor attic ladder, shaped charges situated at various points on the second floor ceiling, drone access through the ladder opening, manned and unmanned access by cutting through the roof, and complete leveling of the home. As stated above, no records exist that any of these methods were actually attempted. The following interview was taken after the eldest daughter of the Lee family, Olivia, was located in █████████, ██, working as a landscape contractor after changing her name to Rebecca Feldman. Ms. Feldman: The attic, I know. I thought somebody would come after me about that, I just didn't think it would be so soon. Dr. Garrett: Are you saying you're aware of this phenomenon? Ms. Feldman: I left my parents when I was a kid, Dr. Garrett. We… we had always fought. They weren't happy with the choices I had made, the things I believed in, the people I spent time with. There was anger there, so much anger I thought it might suffocate me. When I left, I felt like I could breathe again. I never went back after that, but… sometimes, I can still feel it. You know how you feel when you're dreaming, and you're trying to run from something but you can't see it and you don't know if it's really there, but you run anyway? That's how it feels. Dr. Garrett: What prompted you to leave your parents? Ms. Feldman: There was one night, we had a fight, and my dad was drinking and mom was even worse off at that point, and… I had kept a knife under my pillow for a long time, in case something would happen, and they came into my room that night, I don't know what their intentions were, but I drew it and backed them into the wall. The whole thing felt like I was being choked, and that was the first time I heard it, something moving above me. I dropped the knife and ran, and I didn't look back. Dr. Garrett: Do you… do you know anything about what is in the attic, Ms. Feldman? Ms. Feldman: There are always secrets, doctor. There's only so much that hate can build up in a place before it starts hating you back… I don't know what's in the attic, or if there's anything up there at all, and I don't think I want to. At the conclusion of this interview, Ms. Feldman was detained by Foundation personnel, pending further investigation of her claims. Currently, it is believed that Olivia Lee does not exist, nor has ever existed. The information in Interview Log 2740-C is undergoing further examination. 1. This information was gathered after discussions with the three young Lee children, each of whom referred to an event where their mother entered the attic, stayed for several minutes, and then descended. No other information was recovered regarding this event.